Summer is coming, summer is coming!! Right now, all we can think about is how great that sunshine is going feel. However, come mid-June you may be wishing you had a little bit more shade in your backyard. With Kent Mohler Exteriors you can transform a plane jane existing deck or patio into a lovely, shaded outdoor oasis. 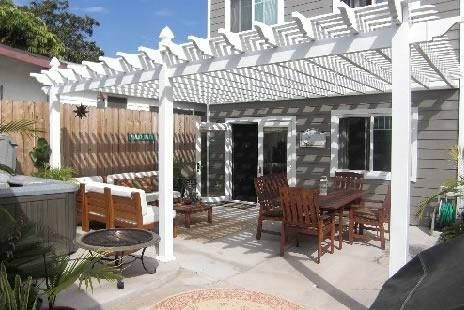 Below I have outlined some reasons to consider a patio cover. As mentioned above it will create some shade from the hot sun and harmful UV rays. I don’t know about you but I don’t ALWAYS want to slather on my sunscreen to go outside in order to protect my skin from premature aging. I like the idea of being able to have lunch or dinner with some protection. Patio covers can also provide protection for you and your investments from rain, hail and snow. Year around protection is available at a reasonable cost to you. Covers are custom fabricated and installed to suit your needs at a price that fits your budget. Versatility, not only can covers work in your back yard for functional and aesthetic purposes but also as functional storage for your car or maybe an extra car. Some people use patio covers as car ports or an extra storage area for boats, sea-doos or trash bins. Depending on your preference, you can choose between a solid roof or a lattice roof. You can also decide if you prefer this structure to be attached to your home or if you prefer it to be a free standing structure. Patio covers are virtually maintenance free. They are also custom designed and custom fit to compliment your home’s architecture. Real wood burns, rots, peels, gets termites, cracks and warps. The material we use for patio covers is not made from wood and it won’t warp, rust, crack or rot. Your investment will look new for years.